I don't know what to call it. A console? A buffet? 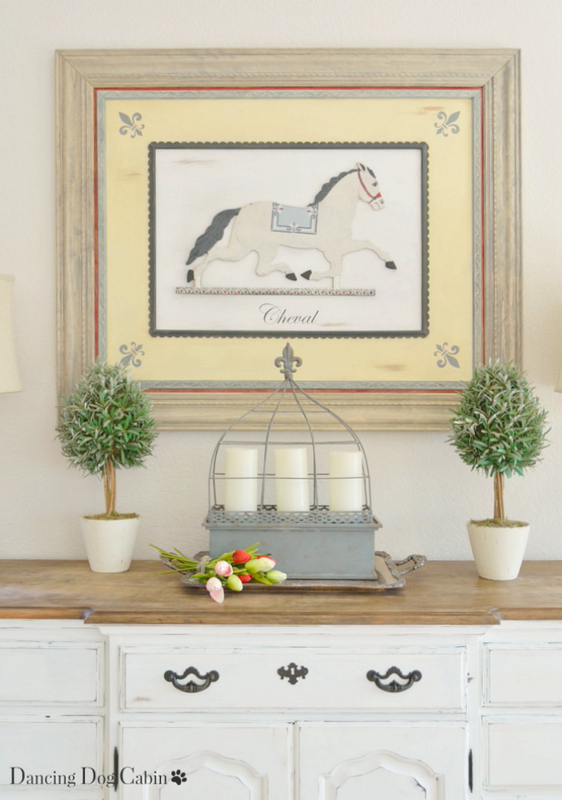 A sideboard? 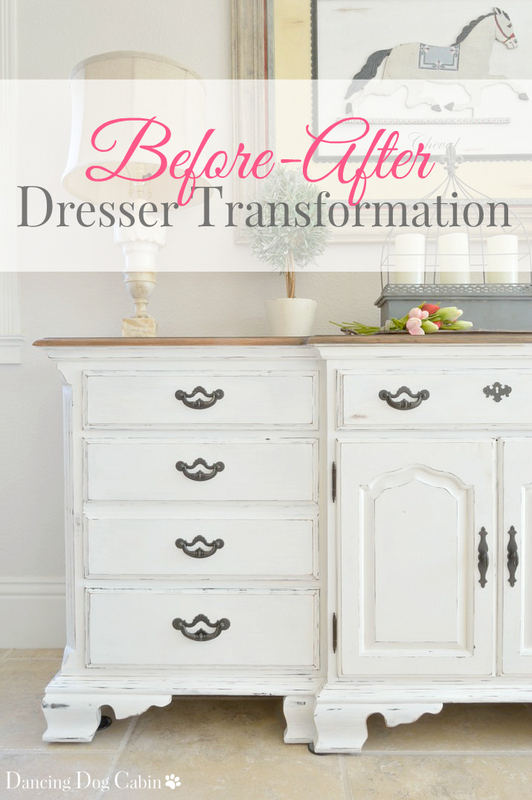 In its former life, before I transformed it, it was a large dresser. I guess it still is, but with a new look and purpose. Anyway, I managed to drag it and push it into our front hall with the help of those wonderful little furniture moving disks and pads (those things with either plastic or felted surfaces for easily moving big, heavy furniture around on carpeting and hard-surface floors). And then I collapsed on the couch with a heating pad and some ibuprofen, leaving Big Beast for another day. I'd been half-heartedly looking for something to put at the far end of our living room for the past few years. 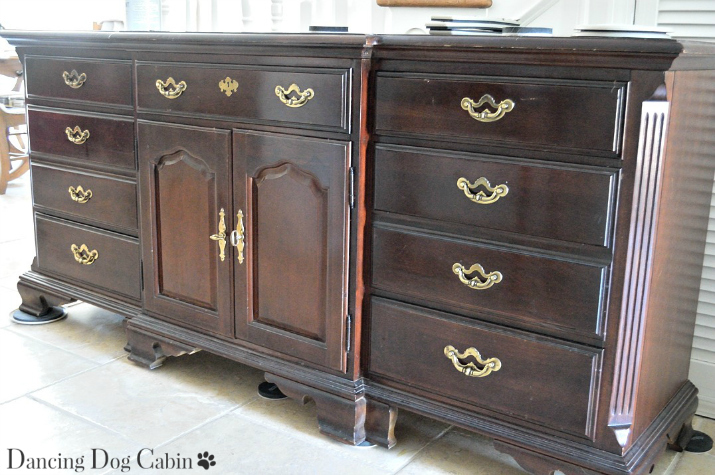 My ideal find would be a sort of console or buffet with lots of character and drawers. Some old piece with high potential as a fixer-upper. However, thanks to the Cabin Project (click here for more on that), this particular project resided somewhere near the bottom of my list of priorities for a long time. Before Beast, I had a small side table (really, it's a small desk) at this location as a sort of placeholder until something better came along. It was too small and dinky for the space, and had hardly any storage, but it at least provided some kind of focal point at the end of this room. Christmas decorations figure prominently at this end of the living room every December since our Christmas tree always goes in the corner at this end of the living room. 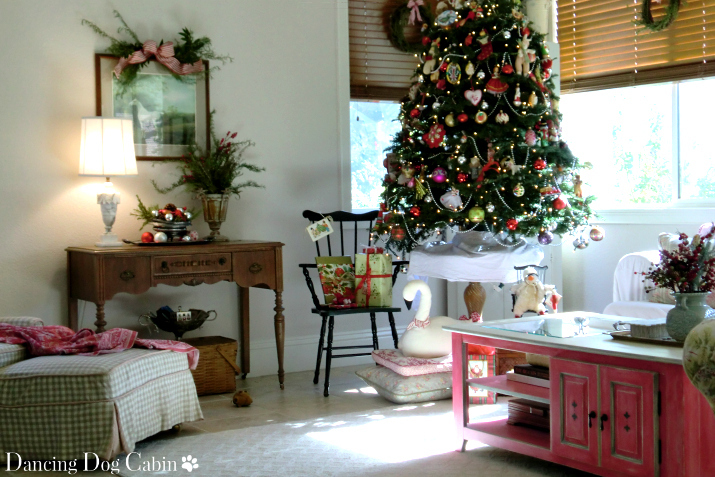 A bigger piece of furniture would only mean more Yuletide joy at this end of the room. About a year and a half ago I finally got tired of Small Desk's underwhelming performance in the living room and got serious about finding a suitably large buffet or console with a lot of storage. 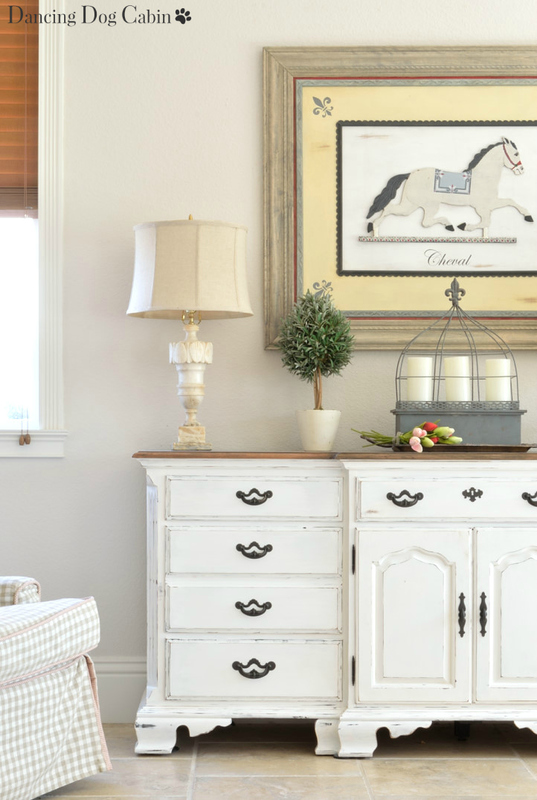 I did all the things everyone does when looking for a furniture project: I scoured local antique malls and consignment shops, visited many garage sales, and spent hours scrolling through Craigslist. Hours and hours. You have to spend a lot of time sifting through some pretty ugly and uninspiring stuff before finding anything worthwhile on Craigslist. Patience and doggedness is key. After several months of tedious searching, I finally found something that ticked all the boxes. The dark, shiny finish didn't bother me at all, since I planned to transform it with paint. This guy also had the big, chunky presence I felt was necessary to anchor the far end of our rather long and narrow living room. And I just loved the feet; they had the right amount of curvy flourishes without being too feminine. It is certainly well made-- remember my cracking back? Heavy furniture is well made furniture, they say. Plus all the drawers have dove-tail joints, another sign of quality craftsmanship. I started off by sanding, sanding, and yet more sanding with both a palm sander and by hand to dull down and scuff up that very shiny, dark cherry finish. All those nooks and crannies, the fluted corner, and the feet look wonderful when painted but are a huge pain to sand, since all those finicky little details must be sanded by hand. The top was extra shiny; in fact, when I first saw it, I thought it had a glass top. 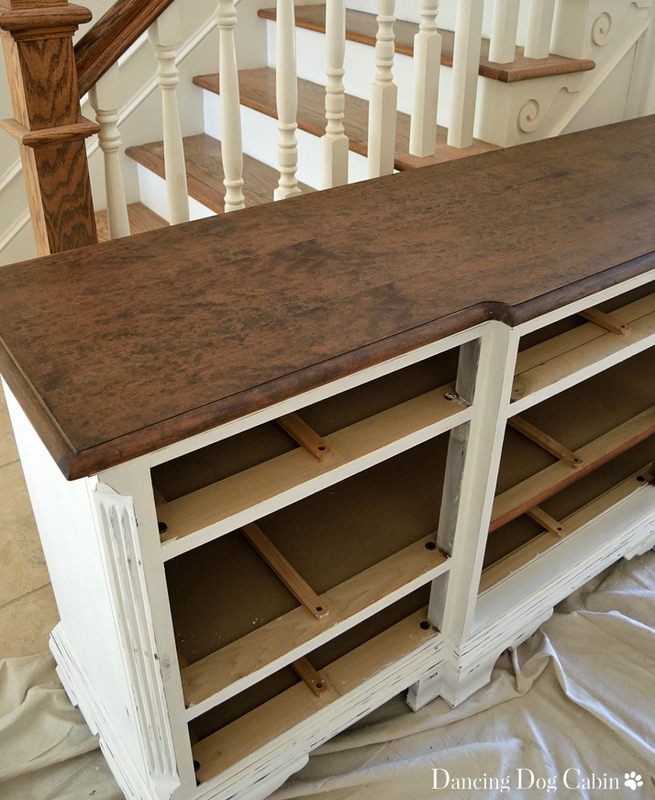 I didn't remove all of the stain from the sides and drawers, just enough to prepare the surface to take the paint, but I removed it completely from the top, since I planned on staining the top. Staining the top with Minwax Dark Walnut. I wanted to keep Big Beast on the rustic side of things and decided a natural wood finish on the top would offset all that white paint very nicely. Dark Walnut was too dark and new looking, however, so I got out the sander and roughed it up to give it a distressed, aged look. While I used a very coarse, 80 grit sandpaper to remove the original stain, I used a medium, 120 grit sandpaper to knock back the Dark Walnut for a distressed appearance. I finished it with a fine grit (220) sandpaper to give it a satiny-smooth surface and used a matte polyurethane to give it some protection, with no shine. Much better, yes? This is more in line with the chippy, aged result I was after. 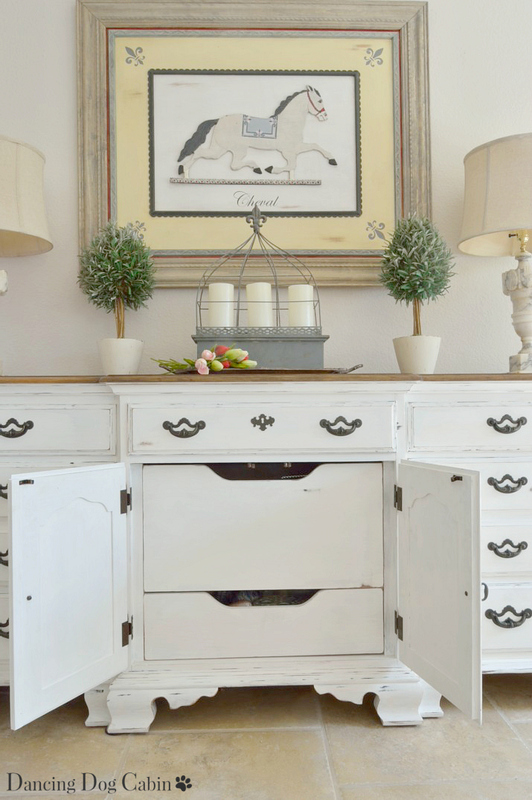 I painted it with Annie Sloan Pure White chalk paint. I know the product info says that you don't need to do any prep prior to painting, but as I found out with this Ikea bookcase upcycle project, this isn't exactly true. With slick, high gloss finishes, you really do need to rough it up a bit if you want the paint to stick (thus I sanded this thing until my hands were ready to fall off, as noted above). I also removed all the hardware and spray painted each piece with Rust-oleum oil rubbed bronze spray paint. Instant vintage character; no more brash, brassy finish. 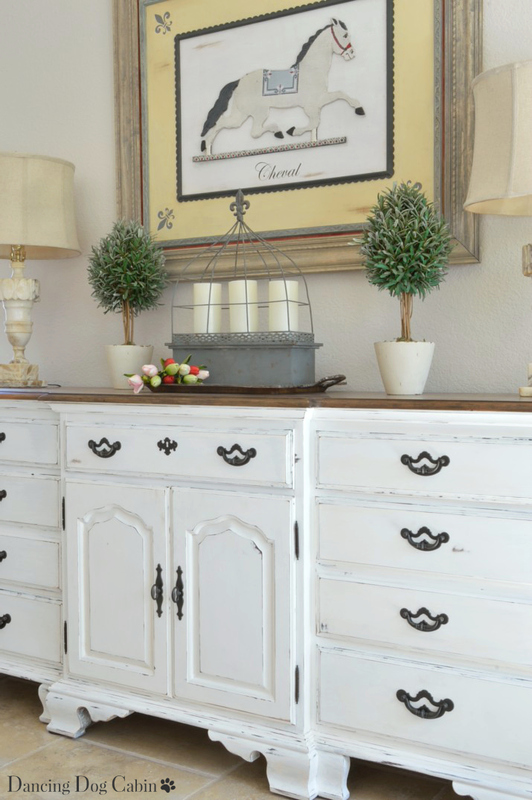 This is a great way to re-use the drawer pulls that come with an old piece of furniture. 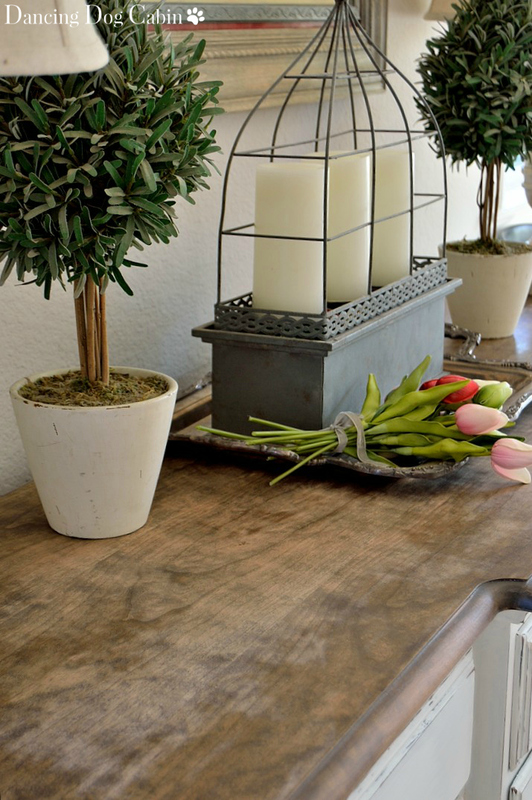 If you like the basic hardware, but don't care for the for the finish, just spray with metallic spray paint in the color and finish of your choice. Last step: aging and 'rusticating' the piece with yet more sanding. I knocked off some of the paint from the edges of the drawers and other strategic areas by hand and with the sander; I used medium and fine grit sandpaper for this step. 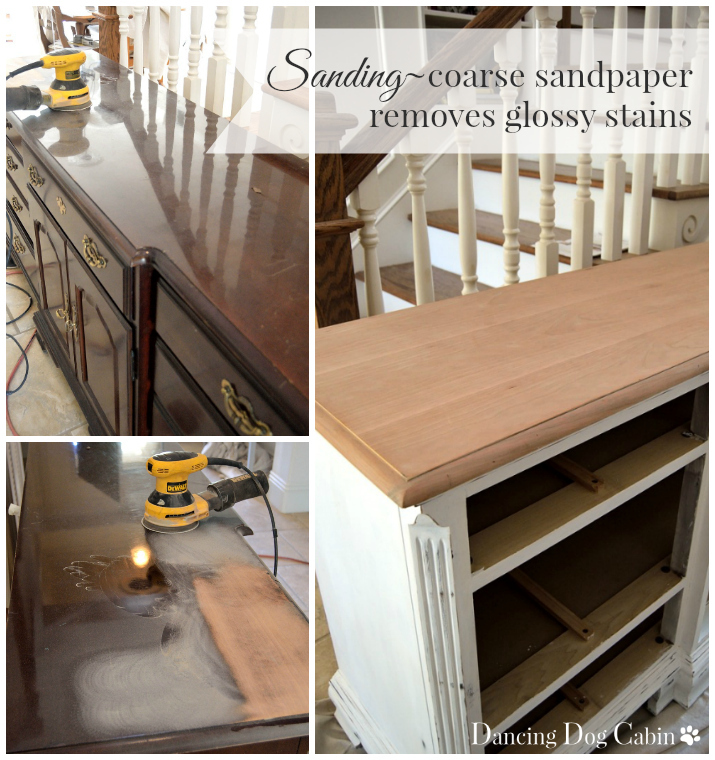 A little bit of sanding highlights the edges and decorative details very nicely, especially important for furniture that is painted white. Did I mention it has great storage? More roomy drawers hide behind those doors. Early spring...with some lovely faux tulips. Thank you Cynthia! For now, I'll call it a console. That piece looks heavy! Nice transformation! It really turned out great! Thank you Cecilia! It's definitely very heavy. What a great storage piece! I'm envious. Here are some tips...always use ice, not heat, when you first strain your back...and don't waste time on M.D. 's or expensive physical therapists...find a good chiropractor! If you can find someone trained at Northwestern Health Sciences University, Bloomington, MN, you'll be in good hands...and no, I have no connection with the university, but my last two chiropractors trained there are both are fantastic. Just call the university and ask if they have any graduates practicing in your area. Good luck...and stop lifting heavy furniture! Thanks for the information Teddee! I've recovered at this point, but I'll keep this in mind if I hurt my back again. You should be proud of the way it turned out!! Thank you! I'm pretty pleased with it. That is one beast for sure, Melissa! But you tamed it with the beautiful combination of the wood and white paint. I really like how you toned down the stain on the top. I'll have to keep it in mind for future projects! Enjoy all that storage! Thanks Mary! Sanding took away some of the red tones of the Dark Walnut stain as well. 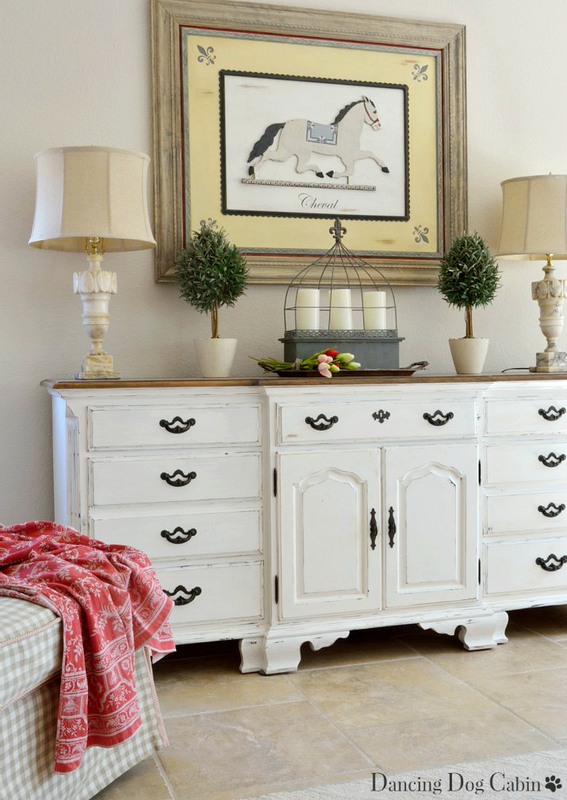 This is a beautiful piece of furniture. Nothing is more classic than white with a stained top. You did a fantastic job on it. together, just has such looks so clean and fresh to me. Thank you Nellie! Yes, I think this is a big improvement over its previous dark red finish. Melissa, this piece turned out wonderful! I love the color and it has the perfect amount of distressing. Worth the bit of back pain I am thinking. :) Thanks for sharing with SYC. Thank you Mary! 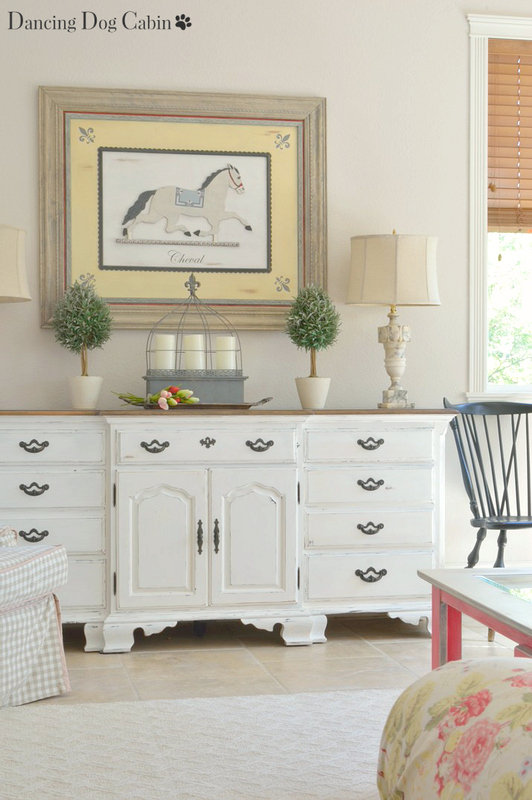 Yes, paint can work miracles when it comes to refreshing old furniture. Wow - it looks fantastic. I love how you stained the top. And this is a piece you could use just about anywhere. Beautiful job! What a beautiful transformation! Thanks for sharing @Vintage Charm--pinned! Thank you Rue! Yes, I was very happy to be done with the sanding on this one. Hi Melissa, just hopping back to let you know that you are being featured at SYC today. Hi Melissa, I'm featuring your beautiful makeover tonight at Best of the Weekend! Thank you for featuring me Amy! OMG...this is a great find! Your finished project is drool worthy gorgeous. I usually don't favor painted white pieces, but you knocked it out of the park. 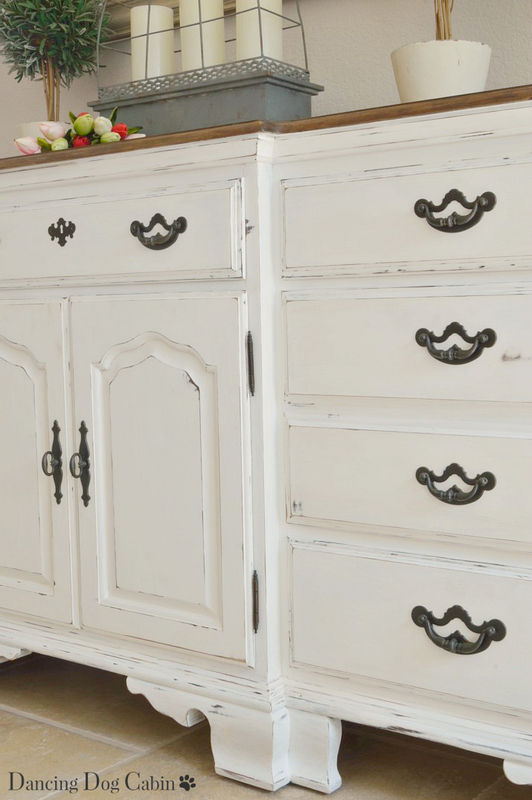 This has a perfect stained top and the distressed edges on the painted parts look as if this piece was meant to be this way. Thank you! I debated about the paint color, but I’m pretty happy with the result.